This installation was on show at Museum Sculptures at Sea in The Hague from January 21st till March 16th, 2014. “Lounge Chairs” is made of untreated weathering steel. This steel corrodes heavily, a process that is enhanced by the seaside location. Here the sun, salt and sea intensify the velvety red-brown rust. The “Lounge Chair” is reduced to the essential. 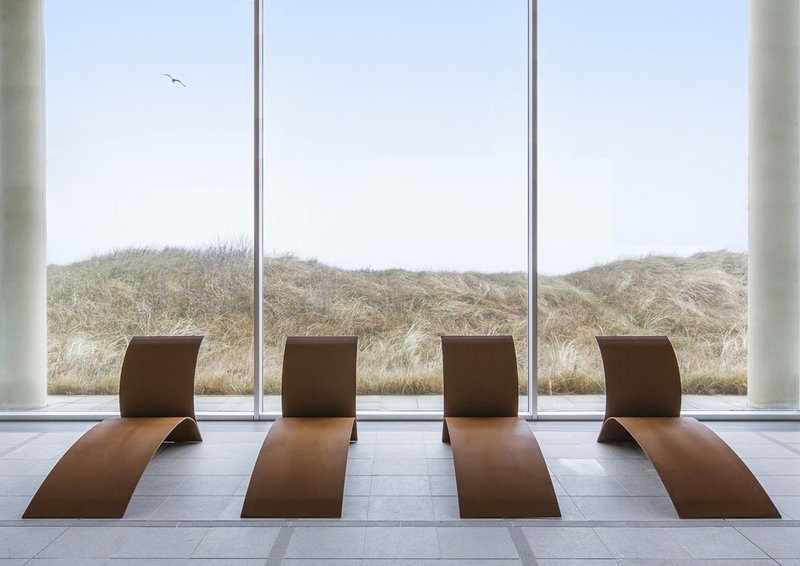 Viewed from the side, the backrest and the seat form a single dynamic line, a line that relates to the curves of the waves and dunes. This relation is emphasized by this unique location at sea. The “Lounge Chairs” are not really to lie on. Rather, the idea behind this seating sculpture is an ironic subversion of the promotionally effective promises of the feel-good industry. After all, when every canteen is declared a lounge, any old chair is called a lounge chair and any back room is referred to as a wellness haven, the real value of relaxation is lost.